Marvel Two-in-One #77: Only the Swamp Survives! As almost inevitably happens when Ben goes back to test piloting, something goes awry (a mechanical malfunction), and the plane crashes. It comes down in the Florida swamp, and a barely conscious Ben stumbles out of the wreckage. Page 23, panel 5. In a flashback to World War II, a pre-Thing Ben Grimm takes out some Nazis with his feet. "Wah-hoo! It's Clobbering Time!" 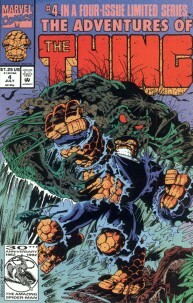 This issue was reprinted in 1992 in Adventures of the Thing #4, part of a four isue miniseries of MTIO reprints. Does it ever go well for Ben when he becomes a test-pilot? Already in this series he's crashed a project for Tony Stark (MTIO 12), and it happens over in the Fantastic Four as well (vol. 1, issue 193, for example, or even FF vol. 1, issue 1!). They never seem to be Ben's fault, but he sure seems to be a jinx. No wonder Alicia burst into tears as soon as he agreed to do it! This is another issue where the titled "guest star" really doesn't matter. All the Man-Thing really does is follow Ben around in the swamp. This seems like its supposed to be an emotional "Ben" story, but it never quite clicks. The author eventually manages to get the same idea across to a much better degree in the now almost-classic MTIO Annual 7. The Howling Commandoes flashback is fun, but even by 1981 the World War II connections seemed incongruous- for Ben to have been a pilot in WWII (give them the benefit of the doubt, we'll place him at age 20 in 1945, though thats probably still too young), he would have been born in 1925, probably earlier, making him 56 at the time of publication of this comic. Somehow I picture him a little younger than that. Volume three of Essential Marvel Two-in-One (released on July 15th, 2009) begins with MTIO issue #53 and reprints, in black and white, every MTIO issue up to and including this one, as well as Annuals #4 and #5. To my mind, this is clearly the class of the four Essential MTIO volumes.